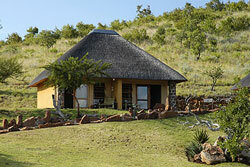 A Gift from God lies amongst the gently rolling hills of the Southern African Escarpment, Hannah Game Lodge. 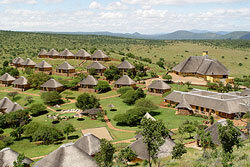 This beautiful Private Nature Reserve embraces more than 8000 hectares of Malaria - free, unspoiled African Bushveld. 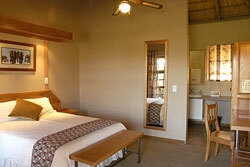 Hannah offers a Bushveld experience at affordable and realistic rates. Professional, friendly and down to earth service characterizes this warm and peaceful getaway. Hannah is a reflection of Africa in its entire natural splendor, a captivating tapestry of African sounds, smells and colors. The rising sun showers the valley with shades of pink, red and orange. Here the visitor experience a rare sense of freedom and renewed inspiration. Continuously and without compromise, we will always strive to deliver a natural and magical experience that can be savored and remembered. Upon arriving at the Lodge, staff at the reception takes pleasure in welcoming you and making sure that you settle in within no time. A fully stocked bar is available to quench your thirst. Enjoy a sundowner on our terrace while watching the sun bathing the late afternoon sky in a spectacular array of colors. With accommodation and meals fit for a king, unspoiled nature and wildlife in abundance, game drives and many more activities to choose from, Hannah is a piece of paradise reserved for every nature lover. Comfortable double and twin bedded chalets, each comprising of an en-suite bathroom with a shower, toilet, basin and dressing area. 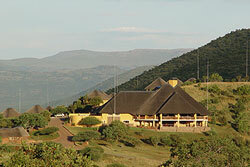 Hannah Game Lodge has 68 thatch roof chalets situated along the edge of the mountain, which provides a wonderful viewpoint that overlooks the Reserve. 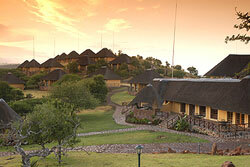 From your own private balcony you may see some of the numerous herds of game passing by at the water hole. Hannah Lodge has comfortable double and twin bedded chalets, each comprising of an en-suite bathroom with a shower, toilet, basin and dressing area. For your convenience, the rooms are serviced daily and have coffee and tea making facilities. 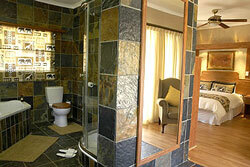 In addition Hannah Game Lodge offers 4 luxury suites with all the amenities for the enjoyment of the connoisseur guest. The 8000hectares of this scientifically managed reserve abounds with plains, hills and mountains to cater for diverse habitats. Apart from Rhino and Buffalo, some 17 species of antelope can be seen, including the very rare Sable Antelope, Tsetsebe, Mountain Reedbuck, Springbok, Eland and Gemsbok to name just a few. 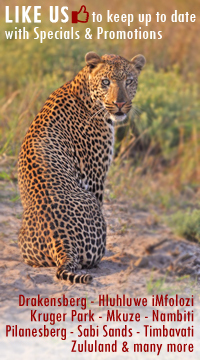 Four Leopards have also been identified in the area, but are understandably, not often seen. For the vivid bird watcher, there are over 250 species of birds on the reserve - it is therefore important to pack a pair of binoculars when visiting Hannah. Apart from the expected typical bushveld birdlife, you can see ostriches and if you are in luck, a Secretary Bird stalking its prey in the grass. One game drive a day is included in the daily rate and can be taken in the early morning before breakfast or in the late afternoon - these trips take approximately an hour and a half. Game walks can be arranged. No matter how you look at Hannah, there are always plenty to do and plenty to see. 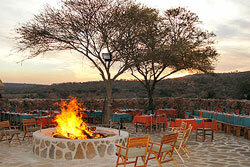 If the bushveld is what you are after, then Hannah is a must. 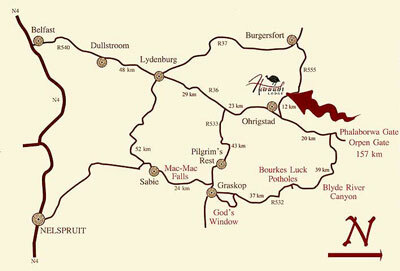 Situated near Ohrigstad, Hannah Game Lodge is ideally placed for those who wish to explore the Lowveld and discover all its treasures - God's Window, Pilgrims Rest, Three Rondawels, and Bourkes Luck Potholes. 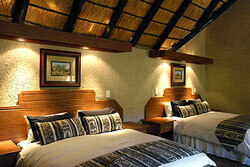 We are a mere 50 minutes drive from the Kruger National Park and a comfortable three and a half hours from Johannesburg. 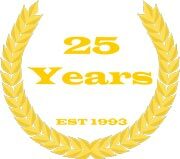 We are one hour from Eastgate Airport, Hoedspruit. Some attractions in the immediate surrounding area of Hannah Game Lodge are the Echo Caves, Kapama Cheetah Breeding Project, Moholoholo Endangered Bird of Prey Centre and The Ohrigstad Dam. Activities on offer are hiking trails, 4x4 offroad routes, quad and mountain biking, fly fishing and a 9-hole golf course. 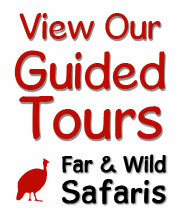 Day excursions to the attractions and activities can be arranged. Hannah has its own private airstrip, which is approximately 800 meters in length, has a grass surface and can accommodate most small aircraft.